Pockets of order seem to emerge from the chaos also known as the Trump Administration. In mid-February, deputy national security adviser K.T. McFarland asked national security officials to submit proposals on ways to deal with North Korea that encompassed all options, including military action, regime change, and recognition of North Korea as a nuclear state. Officials reported back to McFarland a few weeks later. After these proposals are refined, they are supposed to be presented to the president for review and decision. And we learned from the Washington Post that Secretary of State Rex Tillerson and Secretary of Defense Jim Mattis have developed a close working relationship – the two make a point to both meet in person and speak over the phone frequently. “All” that is missing is on the next level: the kind of meetings other presidents often conducted in the Situation Room, in which State, Defense, the Intelligence community, and various advisers made their presentations, exchanged views, and the president then – often after several such meetings – makes a policy decision. Instead we got another Trump dinner at Mar-a-Lago, one in which the secretary of State did not participate because he was in China. Whatever the process, the result so far has been largely to talk tough – with little indication that anybody has thought about what will follow if such talk is ignored. After all, with his trash talk, Trump knocked off 15 presidential candidates, rallied tens of millions of supporters, and won the White House. “Tomorrow the world,” he seems to think. Or, he may well feel that if the push back is too strong, he can always take the opposite position the next day. Just the way Trump first cast doubts about the One China policy and then embraced it; first mocked and belittled NATO and then revealed his unbridled commitment to it; and just as he just revealed that after calling NAFTA “the worst trade deal” – he is seeking only modest modifications. Maybe next he will invite Kim Jong-un over for dinner. True to form, Secretary of State Rex Tillerson proposed during his confirmation hearing that the U.S. should block China’s access to the contested islands in the South China Sea – an extremely provocative statement. However, once in China, Tillerson described the relationship between the U.S. and China as one “built on non-confrontation, no conflict, mutual respect, and always searching for win-win solutions” – almost mimicking China’s preferred line word for word. Regarding North Korea, Tillerson stated that the era of “strategic patience” is over, and that “all options are on the table” to stop North Korea’s expansion of its nuclear program – a program which poses an “imminent” threat. However, when North Korea showed that it was not very impressed with Tillerson’s statements and announced its test of a rocket engine, the White House response was “muted.” And when it followed with another missile test, the Trump administration froze the assets of eleven agents associated with the missile program. It is the kind of weak gesture former President Barack Obama would have – in effect often – made. It is as likely to slow the North Korean nuclear armament program as stop signs will slow a runaway train. Talk about speaking loudly and carrying a small stick. The tough talk may please hawks – until they realize that it puts the U.S. in a tricky situation. In many ways Tillerson’s remarks are similar to Obama’s rhetoric regarding Syria, which established a red line. If North Korea now proceeds full speed ahead with its nuclear arms programs and the U.S. does not react, it will again lose credibility. Loss of credibility will embolden North Korea and other adversaries. If, on the other hand, the U.S. will feel forced to strike to make good on its threats, it faces only bad options. Above all, the lack of an East Asia policy is reflected in the Trump administration’s approach to China, and to China’s role in dealing with North Korea. Trump’s complaint that China is not helping in the matter suggests that he thinks that China somehow owes it to the U.S. – or to his vision of the international order – to twist North Korea’s arm to the point where it will not just freeze its nuclear program, but actually roll it back. 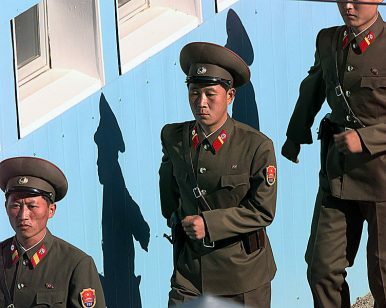 Others have called for imposing sanctions on China to make it help turn North Korea around. As I see it, the U.S. and China have a large number of shared and complementary interests. It is hence logical to consider what incentives could encourage Chinese cooperation before taking steps that endanger these interests. As I spelled out here recently, the costs and risk for China to rein in North Korea are high, but the U.S. could readily reward such moves without major costs to itself – for instance, by promising to remove the anti-missile THAAD battery from South Korea if North Korea agrees to freeze its nuclear program. At least the U.S. should try incentives before confrontations. Trump may wish to note that even his devoted supporters will not be long satisfied with talking tough if such talk is not followed with any signs of success. Amitai Etzioni is Professor of International Relations at The George Washington University. For more discussion on this topic, see “The China Options” and the forthcoming book Avoiding War with China (The University of Virginia Press, May 2017). What if Washington came to terms with a nuclear North Korea but remained on the peninsula?